1Place edamame into a large pot and cover with salted water. Place over medium-low heat, bring to a simmer, and cook until tender, about 5 minutes; drain. 2Puree garlic in food processor until minced. 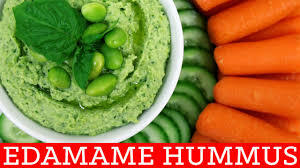 Add edamame, tahini, water, cilantro, lemon juice, olive oil, kosher salt, cumin, and cayenne pepper; blend until smooth. Fresh Delicious hummus with a twist.